As a beginner sewist, I've come to realise very quickly that although I am quite adventurous, it is easy to become disheartened when things don't turn out quite right. My experience with the bodice of Vogue 8667 is a testament to that.. I was almost ready to pack it in as frustrations mounted last weekend. It didn't matter how many times I read the instructions, or how slowly I read them out loud to myself whilst holding and rearranging the pattern pieces, I just couldn't figure out when the damn neckline and armhole was to be machine stitched. It almost drove me batty. So many times, it's just a matter of ripping out a seam and re-sewing, but increasingly lately I find myself thinking, "if only someone else was here to talk me through it!" Things are never so frustrating when you have someone to share with. I'm finding the same when it comes to fit: although I have read the tutorials, and spoken to the lovely ladies at the fabric shop, until I sit down with someone and actually have them help me alter a pattern or muslin, I don't think it will really make sense (in fact, I am looking and looking for a class that's held on the weekend where I can learn how to alter a commercial pattern properly and fit a muslin). A Sew-Along is like a long-distance sewing meet-up. Like when two friends who live in different cities go see the same movie separately together, and then call each other to talk about it afterwards. It’s like that, but for sewing! I like the sound of it. I like it very much. For Christmas, I requested received from my beloved, the wonderful Colette Sewing Handbook. I had my eye on it not only because I really love the tutorials written by the team at Coletterie, but because it also includes 5 Colette patterns, and I'm alllll about adding to my stash. I really want to work through the patterns in the book, and sew them properly. That includes getting the fit right, and working on my seam finishes etc. The only problem has been my apprehension that the pursuit of 'doing it properly' might actually end up with me dumping the whole thing in the too-hard basket. And so... it was just perfect timing when, with Vogue 8667 on temporary hiatus, I saw on Coletterie that there is to be a sew-along, working through each of the patterns in the book! Enter "Sew Colette"- starting with the Meringue skirt. 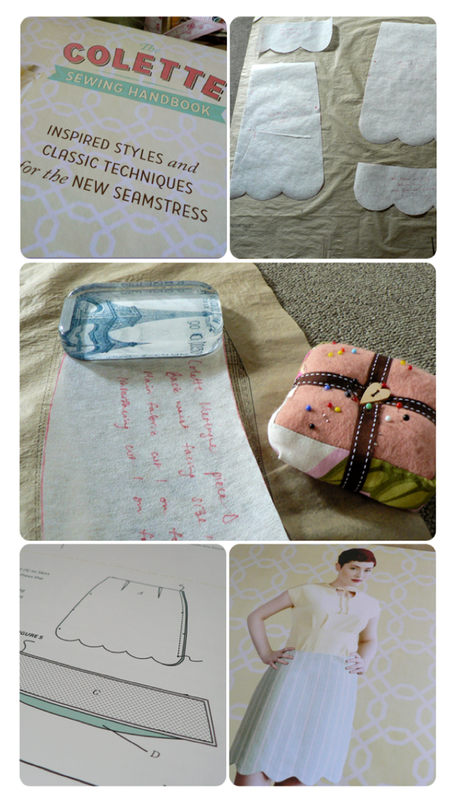 I am a little late making my start, but last night I traced out my pattern pieces, and today is muslin day. I can tell already that I will be making some alterations to get a good fit on the hips, and lengthening the skirt a bit so I can use it for work. I cut a size 12 pattern, but that was so it fits on the waist (I am rectangular...), and consequently the hip measurement is going to be too big, I think. I will post some more pictures once I get to muslin stage and start tweaking.